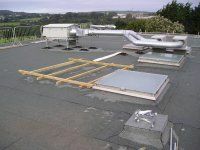 Premier Mastic Asphalt is the South West's leading installer of commercial asphalt roofing. We design and install new roofs to meets our customers' individual needs. We also rebuild and repair existing roofs, to extend their structural life and provide peace of mind. Our customers are our first priority which is why we guarantee workmanship that is second to none and a friendly yet professional customer service for each and every one of our customers. Mastic asphalt continues to lead the way in roofing, flooring, paving and structural damp-proofing. As such it is increasingly specified by many of the nation's most prominent commercial organisations, and for some of the country's most impressive buildings. It is one of the world's oldest and most successful waterproofing membranes; and with the application of modern science still cannot be matched for its strength, longevity and competitive pricing - which is why it remains the material of choice across the country. Our knowledge and expertise in dealing with mastic asphalt means that we should be your first and only choice for any advice or assistance that you need. We realise that some specifications may be unsuitable for particular applications or specifications - which is why PMA also offers effective alternatives in the form of built-up felt and single-ply membranes, in which PMA is recognised as one of the region's top installers of waterproof systems. When you need any assistance with commercial roofing remember Premier Mastic Asphalt where we can provide you with a second to none service.